The links below suggest how the ‘packages of change’ could be developed in detail, based on the methodology previously described. It contains an initial assessment of the current situation and sets out an indicative plan for drawing on combinations of new capabilities to enable operational improvements in each of the packages. 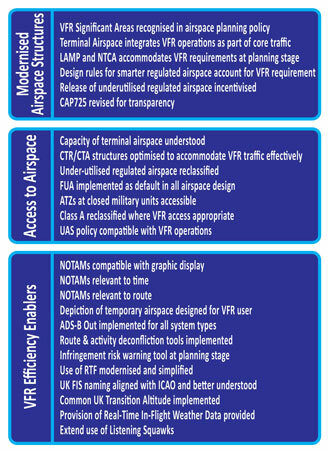 While set out in some detail, it should be viewed as ‘indicative’ and a ‘work in progress’ illustration of how the VFR Deployment Plan might be constructed. In particular, it is based on analysis that primarily reflects the needs of VFR operations by civil and military aircraft and requires further development to incorporate the requirements of CAT and other IFR users. Note that there is no intended meaning to the different colours in the Package of Change timelines.